I recently added a Ha filter to my collection and promptly put it to the test by soaking up a decent amount of data on the Horsehead nebula. I wanted to improve on my initial attempt on this target from 2014. 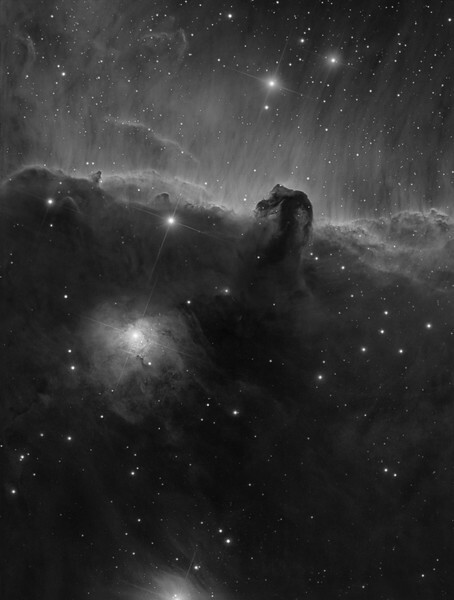 One of the issues was that I'd like to show the delicate 'curtain' structure of IC 434, the bright glowing hydrogen emission that the Horsehead is silhouetted against. This also prompted me to add more data to the LRGB channels as well in order to bring out the faint dust details better, so all together with last year's data I ended up with over 26 hours of data which I completely reprocessed and assembled into this updated version. I'm pleased that the result has higher resolution and more depth than last years' effort. The colours are also richer and more refined and in particular the Ha curtains now stand out above and around the Horsehead. About the image: The Horsehead Nebula (also known as Barnard 33) is without doubt one of the most recognized and fascinating objects in the sky. This iconic feature is formed by the sharp outline of a dark dust cloud, with a remarkable likeness to a horse's head, silhouetted against a brightly glowing patch of ionized Hydrogen (IC434) that is being energized by the hard ultraviolet radiation from nearby Sigma Orionis, a quintuplet star system lying just outside the top of the image.